Maximum Ink: Your technique on guitar is pretty incredible. It’s unique, and really difficult. How long have you been playing? 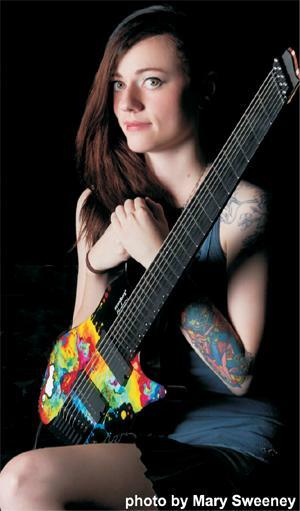 Sarah Longfield: I’ve been playing guitar for about 10 years now. I started off playing piano when I was about 8 and have taken up various instruments since then, but guitar is what comes most naturally! As for my playing, I don’t know much about theory or proper technique, but I like to think having to work around that is what has helped me to develop my own style. MI: Who’s in the band, and with your different interests in music, how’d you get together? SL: My two band mates are Steve Meyer on drums, and Steve-O Wilkes on guitar. Steve has been playing drums for 18 years and Steve-O has been playing guitar for 14 years. We ended up together because Steve was seeking a guitar player for a jazz band while I was looking for a band to play the solo material I had written and recorded in my basement. After jamming a couple of times, it all sort of fell into place. Steve-O then came into the picture a short time later, after our original guitar player left the band. MI: How do you describe your music? SL: I think it’s sort of difficult to find ways to describe your sound. I would say my own style is a combination of influences including jazz, prog, and electronic music. I really like to incorporate electronic aspects into our songs, and utilize unique guitar tones to achieve the sound we are going for with The Fine Constant! MI: Where are you from originally, and are you planning to stick around the Madison area? SL: I was actually born and raised in Middleton, Wisconsin. I am pretty comfortable in Madison as of right now. I have so many friends and family here, and it’s really an awesome place to be; though as a band, we are considering relocating to a different city. Preferably somewhere a bit bigger and warmer! MI: Well, that would be the Madison area’s loss! So are you a full-time band at this point? SL: Arguably, I would say we are a full time band, but all of us still work day jobs and have other obligations. 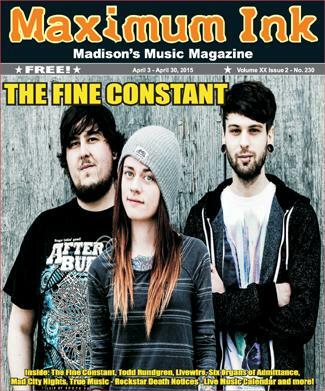 We also have our separate interests outside of the band, and we like to stay busy! It helps us remain motivated and inspired. All of us are also involved in multiple music projects but The Fine Constant is now our main focus. MI: Was it easy to stay focused for your new album? SL: I try to be very diverse in my writing so that I never get bored with what I’m playing. The last album I released was actually an electro/pop album. I think getting that out of my system was a huge reason I was able to write our new one, Woven in Light. If I find myself dealing with writer’s block, I will try to push my boundaries and write in completely opposite styles. Then, often when I return to what I intended to do, it flows so much easier. MI: What accomplishments make you most proud right now? SL: Honestly, I have had so many awesome music-related experiences, it’s hard to pick any specific thing as a defining moment. Every new album is a huge thing for me. I feel like each album encompasses that time period in my life and every time I go back and play or listen to a song, it brings me back to where I was when I wrote it. That, in and of itself, is just a really cool thing to be able to do in music and art in general. I did get to perform at the Uppsala International Guitar Festival last year opening for Steve Vai. That was pretty cool! MI: Congrats! And are you happy with where music is taking you? SL: Absolutely! I have met almost every musician I look up to, traveled to so many new and interesting places, and also met tons of new people! I am very fortunate to have had the experiences I’ve had thus far, and hope to continue having more through my music. I have been very lucky! MI: What’s next, what’s your musical goal? SL: Right now my main goal is to make it through this two-month+ tour we have coming up. I am excited to spend so much time on the road seeing the country, but I am also quite nervous as we’ve never toured for this long before. It’s crazy to think about taking two months out of your life to live in a van 24/7. And I can’t imagine what it will be like to finish the tour, and have to go back to work the next day! MI: Tell me something funny your band-mates will learn about you while on the road? SL: I clean my ears obsessively, and I don’t eat the crunchy ends of my french fries.